The Cardigan Welsh Corgi is a loyal, hard-working, dependable, affectionate and responsible dog. He is fun-loving, open and gentle, polite and easy-going indoors and high-spirited and athletic outside. He can be left alone in a yard for a time, but not all day. He wants to be involved with his family, and needs affection and companionship. He should have daily exercise, like a long walk or a good romp and play around the house. He loves the company of children, and is very protective toward them and toward his family. He's a brave guardian and a good watchdog who will bark to sound the alarm. Sometimes he may bark a little too much! He's friendly and polite to new people, although he may be reserved with them at first. He usually gets along well with other dogs and pets. Because he is protective, though, he can occasionally be aggressive with another dog, and it's best for him to be socialized with other pets while he's still young. He's eager to please and enthusiastic, a very quick and obedient learner who will try to learn anything you teach him. He may want to nip at the heels of his family and guests due to his herding instinct, but because he is quick to learn, he can be trained not to do this. He is a heavy shedder, so he is not be the right pet for you if you are a clean-freak and don't want to do extra vacuuming. The Cardigan Welsh Corgi is 10 to 12 inches tall (to shoulders) and weighs 24 to 38 pounds. He has a medium-length, double coat consisting of a short, soft, thick undercoat and an outer coat that is slightly harsh. His coat color can be red, sable, brindle, black, and black and gray. He has a tail whereas the Pembroke Welsh Corgi doesn't. You only need to brush his coat occasionally, but because he sheds a lot of hair you might find yourself brushing him daily to keep the levels of hair in your home to a minimum (what you brush out doesn't end up on your couch or carpet). The Cardigan Welsh Corgi has been in England for over 3,000 years, and is one of its oldest breeds. He originally came with the Celtic people of Central Europe around 1200 B.C. into the high country known as Cardiganshire, and was raised by Welsh farmers to drive cattle by nipping at their heels. 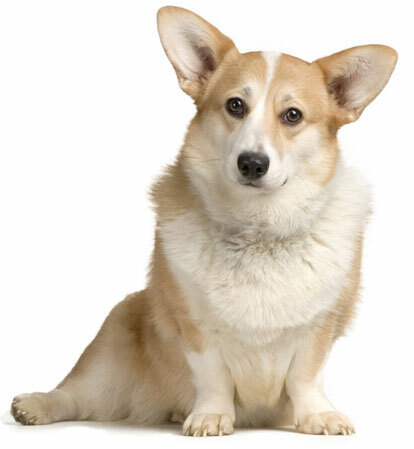 Two breeds, the Cardigan Welsh Corgi and the Pembroke Welsh Corgi, were recognized by the early 20th century. The first English Cardigan Welsh Corgi Association was established in 1926. He was first imported to America in 1931, and was registered with the AKC in 1935. His AKC popularity was 78th out of 157 breeds in 2007.